After over 100 arrests across Leicester and Nottingham last night, we've taken to the streets of both cities to see how the streets are looking, hours after the chaos. Groups of locals turn up in the city centre this morning to start the clear up. Shops take down the safety boards put up overnight and say it's business as usual this morning. One of the many shops damaged by the riots last night. There are loads of double glazing and security firms out in the city boarding up broken windows. Police were putting stickers on damaged windows to let shop owners know where to go to get advise. 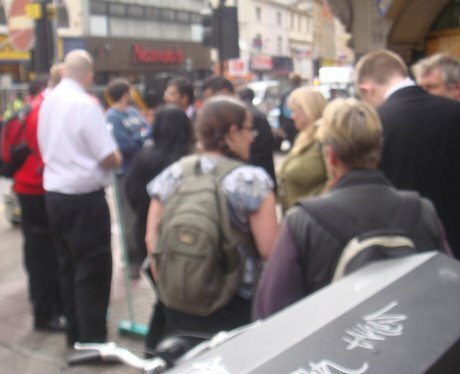 Pound Stretcher was one of the shops with the most damage on Granby Street in Leicester. Lots of tweets about damages at various Nando's across the East Mids - but we've only got this photo of the one in Leicester. Photo of what Canning Circus Police station looks like after being set on fire with petrol bombs. JD Sports in Victoria Centre Nottingham. Another broken window in Victoria Centre from Tuesday night. A boarded window in a branch of House of Fraser in The Victoria Shopping Centre in Nottingham after rioters broke in to the upper mall Tuesday night during another night of sporadic violence in the city. The Meadows police station in Nottingham after it was attacked on Tuesday night.